Single-dose treatment of functional diarrhea. Injectable anti-diarrheal, modulator of intestinal motility. Bencetimide Hydrochloride 0,0165 grams (equivalent to 0,015 grams of Bencetimide base); auxiliary agents and vehicle q.s. 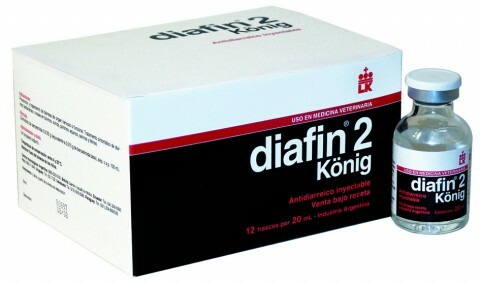 Prevention and treatment of nervous origin (shutting in/penning, movement, driving and transport, of livestock etc.) or functional diarrhea (changes in feed, grazing, pastures and weaning, etc). Symptomatic co-treatment of bacterial or viral diarrheas in bovine, ovine, equine and porcine cattle. Cows and sheep: apply 1 ml for every 10 Kg. of weight, through SC route. For cows exceeding 200 Kg, apply a maximum of 20 ml. Equine: apply 0,75 to 1 ml every 10 Kg. of weight through SC or IM.route. Pigs: apply 1 ml for every 10 Kg. of weight through SC route. The doses should be adjusted in accordance with the seriousness of the condition. If necessary, it may be repeated after 48 hours have elapsed. As a preventive measure, apply 1 hour before the animals are submitted to stressing factors. The doses are half of what is indicated as curative.